It doesn't happened often in Las Vegas, but the Clarion Hotel was imploded in the early morning hours of February 10, 2015. 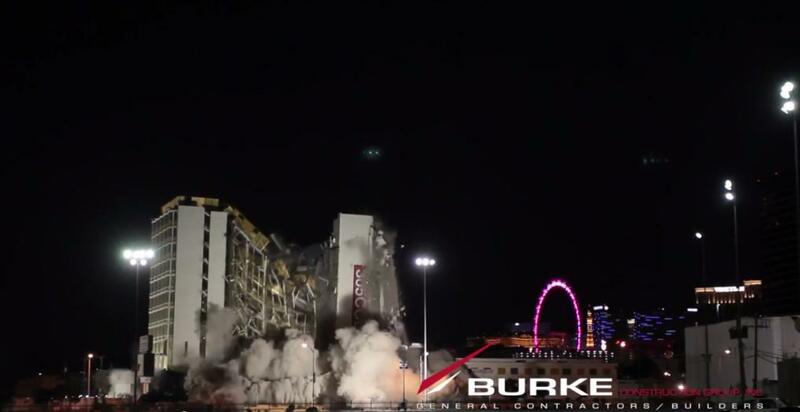 Burke Construction Group, our client and the general contractor over the demolition and new building project contracted our video production team to film the event. The Clarion Hotel, which was opened in 1970 didn't quite give way to the 4,400 explosives that was set to take it down. Demolition crews were surprised that the elevator shaft remained standing after a build up of material formed a temporary base which kept the elevator shaft from coming down. The shaft was later brought down with a crane and cables.